I have found that working with customers that are looking for a home and lifestyle in Sarasota, Florida to move up to a larger space, a better neighborhood, and better schools sometimes lose sight of the original goals. Make a list of the 5 most important lifestyle items to start your search. 1. Is it location for schools or work? If you have to make a choice between the 2, which is it? Is it more important that your children have more time in a school that you feel is going to fit their needs or is it more important that you have more quality time with your children at home and time to engage in family and sport activities? 2. Is location for activities important? Do you require a dock on a Sarasota waterway for your boat or close proximity for beach time? 3. What spaces in your new home are most important? Are you an active person with lots of outdoor toys, boats, and bikes of all sorts? Is a 2-3 car garage or separate storage space essential? 4. How much maintenance do you want to do? Does a large yard and older home appeal to you because of the charm and character? Do you have the means to hire someone to take care of regular lawn maintenance or will that be your weekend job? Or is gardening your source of peace and creativity? 5. Moving to a larger home is not what everyone does? Do you need/want a larger home for a growing family? Or do you want larger outdoor spaces to have for family activities year round and for entertaining? These are questions related to lifestyle that sometimes get clouded over by the excitement of finding a “pretty” house that might appeal to your esthetic nature. If a lifestyle for you and your family is most important then these are factors that you can’t forget. Write down how you want your lifestyle to look like. Create a picture collage to keep the visual up front and center. 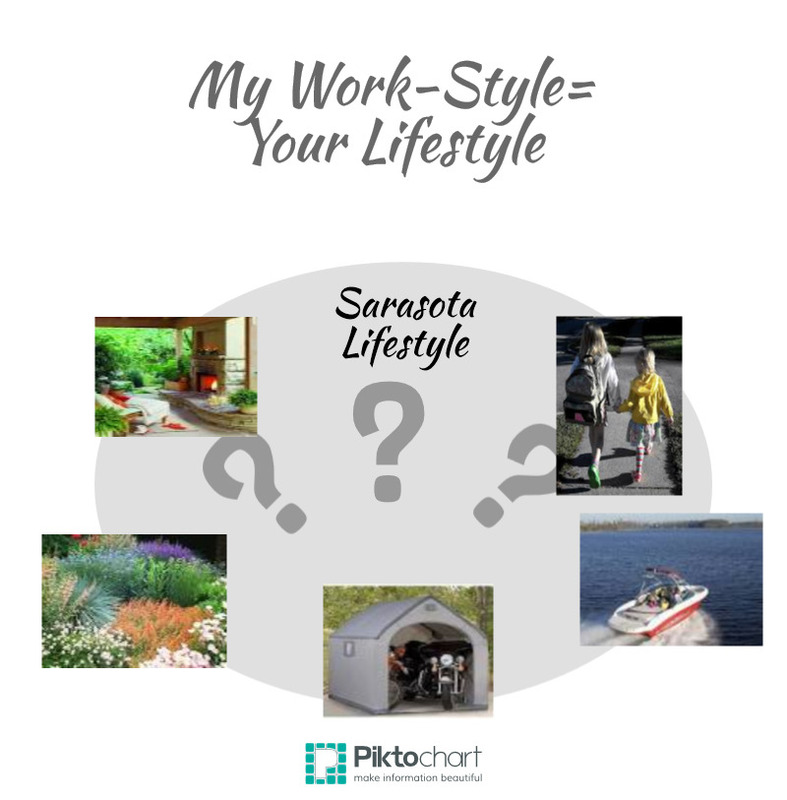 And remember….My Work-Style = Your Lifestyle….so call Sarasota Suze aka Susan Phelps at 941-726-2227. Previous Post How Much More Tax Burden Should Homeowners Bear? Next Post Sarasota Market Still Steaming!